Frankenstein was a genius. As a boy Frankenstein always wanted to know and learn. He loved experimenting. Frankenstein grew up to be a doctor. One day, Frankenstein was sitting in his library when a thought struck him, "Could he take pieces of human body and make a perfect human being?" The question rankled in his brain. "But what about giving this mass of flesh, life." He questioned himself. The answer came to him almost instantly. "Electricity, a great big shock of electric current." The following day onwards Frankenstein started digging up bodies from the grave, amputating either the legs or hands. No one knew of this strange eerie experiment. As days past Frankenstein had all the parts of a human body. He had carefully stitched each piece together. What lay in his laboratory now was a monster of a man with no life in him. Frankenstein thought, "Now for the final step, to pass great big bout of electricity through this monster." All preparations were made. A lever was moved and ZAP....the monsters body shook with the powerful blasts of current. Everything was silent for a moment, then the monster stirred and slowly stood up. He looked much bigger than when he was lying down, he stood at eight feet and weighed two hundred kilos. Frankenstein's euphoria of a successful experiment was short lived. The monster was now coming towards him. The monster walked past Frankenstein smashing the door into the streets. Terror reigned in the streets. Anyone who saw the monster ran for their lives. The monster destroyed everything. Shops were razed to the ground and glasses smashed. Somebody had to stop the monster. In his house Frankenstein himself was in shock; his monster was creating havoc in the city; he had to stop it somehow. He decided to confront the monster. Taking a gun with him Frankenstein went in search of the monster. He found him in one of the street corners. 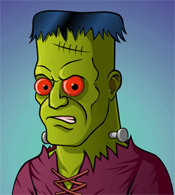 Frankenstein fired all the bullets in the gun at the monster's head, shoulders and chest, killing him. Frankenstein swore to himself to never ever experiment with nature.